The Foot Impulse Tilt Sealer (FIT models) comes Standard with the adjustable angle head that converts from a horizontal to a vertical sealer. 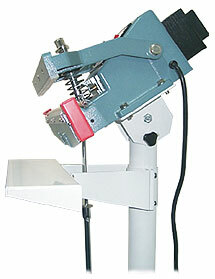 This option allows user to bring the sealing jaws to a better angle, minimizing work and increasing production time. Included is an extended foot pedal and a large Heavy Duty Work Table to support heavier products. The Heavy Duty Work Table is adjustable up or down and can support up to 45 lbs. with ease. The sealing head has an angle that is adjustable up to a 45-degree downward tilt. This system is great for items like powders, grains, liquids and etc. Model: AIE300FIT, 450FIT, 600FIT, AIE305FIT, 455FIT, 605FIT.